Growing: Â Easy/Medium Jack 33 is a sweet-tasting, grape-flavored cannabis strain that is a phenotype of CH9 Flower and CH9 Jack varieties. It can grow well with any type of environment and produce powerful buds with a refreshing, lightly trippy marijuana effect. This is among the different cannabis varieties that are fast-flowering and powerful. Â As CH9 Jack and Flower were combined, what seed breeders have in mind is to produce a type of strain with vigor, high potency, sweet aroma and taste. They succeeded because through the breederâ€™s effort, an exceptional and great-tasting strain like Jack 33 came into the limelight.In 7 to 8 weeks of flowering time, Jack 33 will show buds that are compactand with high potency. Yield is satisfying even if this strain does not require pot growing expertise. 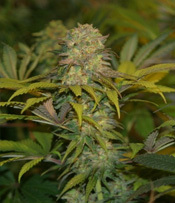 A greenhouse set up will also benefit weed growers with Jack 33 that is potent, sweetly-flavored and fast bud producing.